I’d heard about this story before, but didn’t know the details. Here’s what I managed to find out. Frank Wang setup his coffee stall 15 years ago by the north east entrance to Bethnal Green tube. Early last year Frank says he was asked to move by the council. His stall is on land owned by TFL so he ignored them. A few weeks later he said TFL asked him to move across the road outside Starbucks. I wonder what they’d think of that. Then the disused building behind his stall started being developed into the Chiringuito tapas bar. 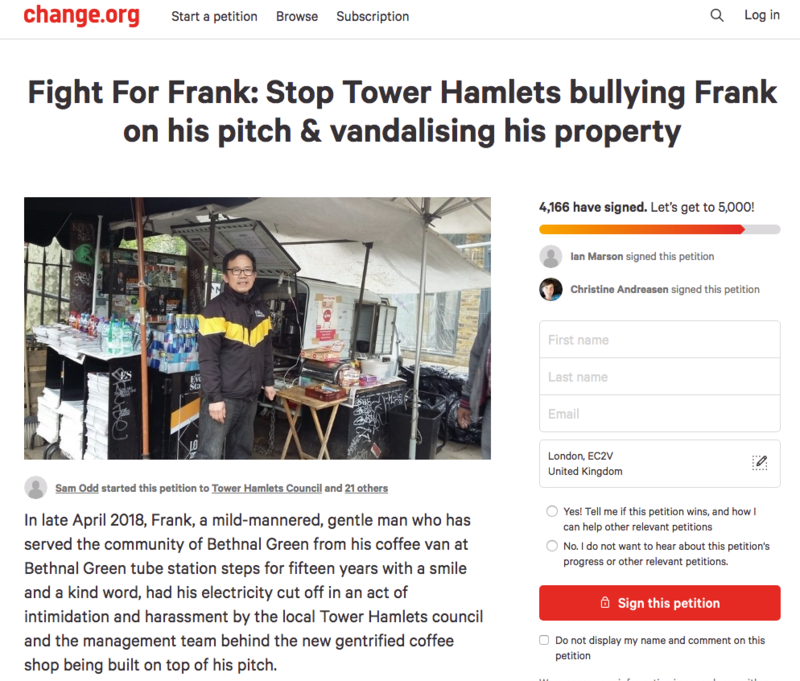 Contractors cut off Frank’s electricity and it turns out that it was supplied by TFL but got to Frank’s coffee stall from land owned by Tower Hamlets Council. It seems to be that Tower Hamlets is leasing the space to Chiringuito, and certainly getting business rates from them. Frank thought that maybe Tower Hamlets had made promises to Chiringuito about moving his stall away from their premises. The solution to the problem came from Frank’s loyal band of customers. They were incensed about the way Frank was being treated. They setup a fundraiser for Frank to purchase new equipment and got a petition going on change.org, which went to Sadiq Khan. Hundreds of protesters with placards turned out in August. Thanks to the political pressure it has been decided that Frank Wang can have his old site back, but it must be smaller. He had to sell his equipment to pay his living expenses, hence the Crowdfunder, which raised the £10,000. There was no sign of Frank yesterday when I took the photo of Chiringuito above, but he hopes to be back towards the end of March.